2018-07-12 First worldwide family litigation filed litigation Critical https://patents.darts-ip.com/?family=45418829&utm_source=google_patent&utm_medium=platform_link&utm_campaign=public_patent_search&patent=CN103649289(A) "Global patent litigation dataset” by Darts-ip is licensed under a Creative Commons Attribution 4.0 International License. In a liquid detergent comprising a subtilisin and optionally a second (non-subtilisin) enzyme, the combination of a peptide aldehyde (or hydrosulfite adduct thereof) with a salt of a monovalent cation and a monovalent organic anion has a synergistic stabilizing effect on the subtilisin and/or the second enzyme. The improved enzyme stability is of particular interest in liquid detergent compositions where the enzyme would otherwise have poor storage stability. 本申请包含了一个计算机可读形式的序列表。  This application contains a Sequence Listing in computer readable form. 本发明涉及枯草杆菌蛋白酶在液体洗涤剂中的稳定性。  The present invention relates to the stability of subtilisin in the liquid detergent. 发明背景 当配制一种液体洗涤剂时，通常包含一种枯草杆菌蛋白酶类型的蛋白酶，以便改善蛋白质污染物的去除能力。  BACKGROUND OF THE INVENTION  When formulating a liquid detergent, typically comprise one subtilisin type proteases, in order to improve the ability to remove protein contaminants. 还可以包含一种第二、非枯草杆菌蛋白酶的酶(例如淀粉酶或脂肪酶)，以便改善对其他污染物的洗涤能力。 May further comprise one second, non-subtilisin enzyme (e.g. an amylase or a lipase), in order to improve the detergency of other pollutants. 枯草杆菌蛋白酶与第二酶(若存在的话)的存储稳定性存在着问题，并且现有技术披露了多种解决方法。 Second enzyme subtilisin and storage stability (if present) is problematic, and the prior art discloses a variety of solutions. 多种硼化合物是熟知的枯草杆菌蛋白酶在液体洗涤剂中的稳定剂，例如W096/41859。  more boron compounds are well known in liquid detergent subtilisin stabilizers, for example, W096 / 41859. 然而，最近EU REACH将硼酸划分为生殖毒性物质(r印rotoxic)后，无硼洗涤剂正逐渐成为一种趋势。 However, recently the EU REACH divided boric acid reproductive toxic (r printing rotoxic), boron-free detergent is becoming a trend. 用于稳定枯草杆菌蛋白酶以及任何第二酶。 And for any second stabilizing subtilisin enzyme. W098/13459披露了一种肽醛与钙离子的组合用于提供协同性蛋白酶抑制剂的益处。 W098 / 13459 discloses in combination the benefits of a peptide aldehyde and calcium ions to provide synergistic protease inhibitor. 然而，高水平的钙离子可能会在液体洗涤剂的配制过程中造成问题，因为它会与助洗剂和表面活性剂发生络合，并且可能会降低所整合的助洗剂系统在洗涤过程中的有效性，并且可能通过与肥皂的络合减少泡沫的产生，形成熟知为皂垢的白色沉淀。  However, high levels of calcium can cause problems during the formulation of liquid detergent, since it would be complexed with the builder and surfactant, and may reduce the integration builder system the effectiveness of the washing process, and can reduce foam generation by complexing with soap, known as scum formed white precipitate. 诸位发明人已经发现，一种肽醛(或亚硫酸氢盐加合物)蛋白酶抑制剂以及一种一价正离子与一价有机阴离子的盐的组合在一种液体洗涤剂中具有一种协同稳定酶的作用，该液体洗涤剂包括一种枯草杆菌蛋白酶以及任选地一种第二酶(非枯草杆菌蛋白酶)。  The present inventors have discovered that a peptide aldehyde (or bisulfite adducts) and one protease inhibitor in combination a monovalent cation salts of monovalent organic anions with a liquid detergent having a synergistic effect of stabilizing the enzyme, the detergent liquid comprising one subtilisin and optionally one second enzyme (non-subtilisin). 这一点在稀释的液体洗涤剂或在液体洗涤剂中是特别感兴趣的，在这些环境中大部分充足的阴离子表面活性剂是较便宜的直链或支链烷基苯磺酸盐(LAS或BABS)，和/或烷基硫酸盐(AS)，因为在这些洗涤剂中维持酶的稳定性可能是具有挑战性的，并且在一些情况下酶的稳定性过低可能会使肥皂制造商不去利用这些酶的清洁能力这一优势。 This dilution of the liquid detergent or liquid detergent is of particular interest, in these environments the most abundant anionic surfactants are cheaper linear or branched alkylbenzene sulphonate (LAS or BABS), and / or alkyl sulfate (the aS), since the maintenance of these detergents in enzyme stability can be challenging, and in some cases the enzyme stability is too low may cause soap manufacturer does not cleaning ability of these enzymes to use this advantage. 该组合物的直链烷基苯磺酸盐以及支链烷基苯磺酸盐(LAS和BASS)和烷基硫酸盐(AS)的总含量比烷基乙氧基醚硫酸盐(AES)和甲酯磺酸盐(MES)大。  The total content of linear alkyl benzene sulfonate and branched alkyl benzene sulfonates of the composition (LAS and BASS) and alkyl sulfates (AS) than the alkyl ethoxy ether sulfate ( AES) and methyl ester sulphonates (MES) large. 枯草杆菌蛋白酶是丝氨酸蛋白酶的一个亚组。  Subtilisin is a subgroup of serine proteases. 丝氨酸蛋白酶是一种催化肽键水解的酶，并且其中在活性位点上存在着一种关键的丝氨酸残基(White (怀特)，Handler (韩德尔)以及Smith (史密斯)，1973〃Principles of Biochemistry (《生物化学原理》)〃,第五版,McGraw-Hill Book Company(麦格劳希尔图书公司),纽约,第271-272页)。 Is a serine protease catalyzed hydrolysis of a peptide bond, and wherein there is a critical serine residues (White (White), Handler (Handel) and Smith (Smith at the active site), 1973〃Principles of Biochemistry ( "principles of Biochemistry") 〃, Fifth Edition, McGraw-Hill book company (McGraw-Hill book company), New York, pp. 271-272). 枯草杆菌蛋白酶包括1-Sl和1-S2亚组,优选地由其构成,正如Siezen (西仁)等人，Protein Engng. (《蛋白质工程》)4 (1991) 719-737 ;和Siezen (西仁)等人，Protein Science (《蛋白质科学》)6(1997) 501-523所定义。 Subtilisin including 1-Sl 1-S2 sub-group and preferably consist as to Siezen (West ren) et al., Protein Engng ( "Protein Engineering") 4 (1991) 719-737;. And to Siezen (West Jen) et al., protein Science ( "protein sciences") 6 (1997) 501-523 defined. 由于丝氨酸蛋白酶的活性位点的结构高度保守，根据本发明的枯草杆菌蛋白酶可以在功能上相当于由Siezen (西仁)等人(同上)提出的指定亚组的枯草杆菌酶(subtilase)。 Since the structure of the active site of serine proteases are highly conserved, it may correspond to the specified sub-group to Siezen proposed by (Hiren) et al. (Supra) subtilase (subtilase) on the function according to the present invention a subtilisin. [0021 ] 这种枯草杆菌蛋白酶可以是动物、植物或微生物起源的，包括化学或基因修饰的突变体(蛋白质工程化的变异体)。  Such subtilisin may be of animal, vegetable or microbial origin, including chemically or genetically modified mutants (protein engineered variants). 它可以是一种丝氨酸蛋白酶，优选一种碱性微生物蛋白酶。 It may be a serine protease, preferably an alkaline microbial protease. 枯草杆菌蛋白酶的实例包括源自芽胞杆菌属的那些，例如枯草杆菌蛋白酶Novo、枯草杆菌蛋白酶Carlsberg、枯草杆菌蛋白酶BPN'、枯草杆菌蛋白酶309、枯草杆菌蛋白酶147以及枯草杆菌蛋白酶168 (描述于W089/06279中)，以及蛋白酶TO138 (TO93/18140)。 Examples include those derived subtilisins, subtilisin Novo, subtilisin Carlsberg, subtilisin BPN 'of Bacillus, subtilisin 309, subtilisin 147 and subtilisin 168 (described in W089 / 89/06279), and protease TO138 (TO93 / 18140). 实例描述于W098/020115、W001/44452、W001/58275、W001/58276、W003/006602 和W004/099401中。 Examples are described in W098 / 020115, W001 / 44452, W001 / 58275, W001 / 58276, W003 / 006602 and W004 / 099401 in. 胰蛋白酶样的蛋白酶的实例是胰蛋白酶(例如，猪或牛起源的)以及在W089/06270和TO94/25583中描述的镰孢霉属蛋白酶。 Examples of trypsin-like proteases are trypsin (e.g., of porcine or bovine origin) and the Fusarium described in W089 / 06270 and TO94 / 25583 metalloproteinase. 其他实例是在W092/19729、W088/08028、W098/20115、W098/20116、W098/34946、W02000/037599、W02011/036263 中描述的变异体以及蛋白酶的混合物。 Other examples are in W092 / 19729, W088 / 08028, W098 / 20115, W098 / 20116, W098 / 34946, W02000 / 037599, and mixtures of protease variants W02011 / 036263 is described in the body. Gist-Brocades (吉斯特•布罗卡德斯公司)，BASF公司、或DSM公司获得)。 Gist-Brocades (Gist brocades • Company), BASF Corporation, or DSM company received). 其他实例是Primase™™和Duralase™™。 Other examples are Primase ™™ and Duralase ™™. 实例还包括可从Henkel (汉高公司)获得的Blap R、Blap S和Blap X。 Examples also include available from of Henkel (Henkel Corporation) Blap R, Blap S and Blap X. 除了枯草杆菌蛋白酶，该洗涤剂组合物可以任选地包括一种第二酶，例如脂肪酶、角质酶、淀粉酶、碳水化物酶、纤维素酶、果胶酶、果胶酸裂解酶、甘露聚糖酶、阿拉伯糖酶、半乳聚糖酶、木聚糖酶、氧化酶、虫漆酶和/或过氧化酶。  In addition to a subtilisin, the detergent composition can optionally include one second enzyme such as a lipase, cutinase, an amylase, carbohydrate, cellulase, pectinase, pectate lyase enzyme, mannanase, arabinose enzymes, galactanase, a xylanase, an oxidase, laccase and / or peroxidase. 该液体洗涤剂可以包含一种、两种或多种非枯草杆菌蛋白酶的酶。 The liquid detergent may comprise one, two or more non-subtilisin enzymes. 合适的脂肪酶和角质酶包括细菌或真菌起源的那些。  Suitable lipases and cutinases include those of bacterial or fungal origin. 包括化学修饰的或蛋白质工程处理的突变体。 Chemically modified or protein engineered mutants. 实例包括来自嗜热真菌属(Thermomyces)的脂肪酶，例如来自嗜热真菌(T.1anuginosus)(之前命名为柔毛腐质霉(Humicola lanuginosa)),如在EP258068和EP305216中描述；来自腐质霉属的角质酶，例如在W096/13580中描述的特异腐质霉(H.1nsolens);—种假单胞菌属脂肪酶,例如来自产碱假单胞菌(P.alcaligenes)或类产碱假单胞菌(P.pseudoalcaligenes) (EP218272)、洋葱假单胞菌(P.cepacia) (EP331376)、斯氏假单胞菌(P.stutzeri) (GB1, 372, 034)、萤光假单胞菌(P.fluorescens)、假单胞菌属菌株SD705 (W095/06720 和W096/27002)、威斯康星假单胞菌(P.wisconsinensis)(W096/12012);一种芽胞杆菌属脂肪酶，例如来自枯草芽孢杆菌(Dartois (达托斯)等人，1993, Biochemica et Biophysica Acta (《生物化学与生物物理学学报》)，1131:253-360)、嗜热脂肪芽杆菌(JP64/744992)或短小芽孢杆菌(W091/16422)。 Examples include lipases derived from Thermomyces sp (the Thermomyces), e.g. from thermophilic fungi (T.1anuginosus) (named before pubescence Humicola (Humicola lanuginosa)), as described in EP258068 and EP305216; from Humicola Geotrichum cutinases, e.g. Humicola insolens described in W096 / 13580 (H.1nsolens); - Pseudomonas lipase, e.g. from P. yield base (P.alcaligenes) or producing class Pseudomonas base (P.pseudoalcaligenes) (EP218272), P. cepacia (P.cepacia) (EP331376), P. stutzeri (P.stutzeri) (GB1, 372, 034), Pseudomonas fluorescens Aeromonas (P. fluorescens), Pseudomonas sp. strain SD705 (W095 / 06720 and W096 / 27002), P. wisconsinensis (P.wisconsinensis) (W096 / 12012); one kind Bacillus lipase, For example, from B. subtilis (Dartois (Datuo Si) et al., 1993, Biochemica et Biophysica Acta ( "Biochemistry and biophysics Journal"), 1131: 253-360), Bacillus stearothermophilus bud (JP64 / 744992) or B. pumilus (W091 / 16422). 其他实例是脂肪酶变异体，例如在 W092/05249、W094/01541、EP407225、EP260105、W095/35381、TO96/00292、TO95/30744、TO94/25578、TO95/14783、TO95/22615、TO97/04079、W097/07202, W000/060063, W02007/087508 和TO2009/109500 中描述的那些。  Other examples are lipase variants, for example, in W092 / 05249, W094 / 01541, EP407225, EP260105, W095 / 35381, TO96 / 00292, TO95 / 30744, TO94 / 25578, TO95 / 14783, TO95 / 22615, TO97 / 04079, those of W097 / 07202, W000 / 060063, W02007 / 087508 and TO2009 / 109500 described. 优选的可商购的脂肪酶包括Lipolase™、Lipolase Ultra™、以及Lipex™ ；Lecitase™、Lipolex™ ；LipocIean™>Lipoprime™(Novozymes A/S(诺维信公司))。  Preferred commercially available lipase enzymes include Lipolase ™, Lipolase Ultra ™, and Lipex ™; Lecitase ™, Lipolex ™; LipocIean ™> Lipoprime ™ (Novozymes A / S (Novozymes)). 其他可商购的脂肪酶包括Lumafast(Genencor Int Inc(杰能科国际公司));Lipomax(Gist-Brocades(吉斯特•布罗卡德斯公司)/Genencor Int Inc (杰能科国际公司))和来自Solvay (苏威公司)的芽孢杆菌属菌种的脂肪酶。 Other commercially available lipases include Lumafast (Genencor Int Inc (Genencor International Inc.)); Lipomax (Gist-Brocades (Gist brocades • Company) / Genencor Int Inc (Genencor International Inc.) ) and Bacillus from Solvay (Solvay) of sp lipase. 合适的淀粉酶(a和/或P )包括细菌或真菌起源的那些酶。  Suitable amylases (a and / or P) comprises those enzymes bacterial or fungal origin. 包括化学修饰的或蛋白质工程处理的突变体。 Chemically modified or protein engineered mutants. 淀粉酶包括，例如a-由芽胞杆菌属获得的淀粉酶，例如在GBl, 296，839中详细描述的地衣芽孢杆菌的一种特定菌株。 Amylases include, for example, from the Bacillus a- amylases obtained, for example, GBl, a particular strain of Bacillus licheniformis, described in detail 296,839. 有用的淀粉酶的实例是 W094/02597、W094/18314、W096/23873 和W097/43424 中描述的变异体，尤其是在以下一个或多个位置上被取代的变异体:15、23、105、106、124、128、133、154、156、181、188、190、197、202、208、209、243、264、304、305、391、408 和444。  Examples of useful amylases are W094 / 02597, W094 / 18314, W096 / 23873 and variants described in W097 / 43424, in particular, substituted in one or more positions variants: 15,23 , 105,106,124,128,133,154,156,181,188,190,197,202,208,209,243,264,304,305,391,408 and 444. 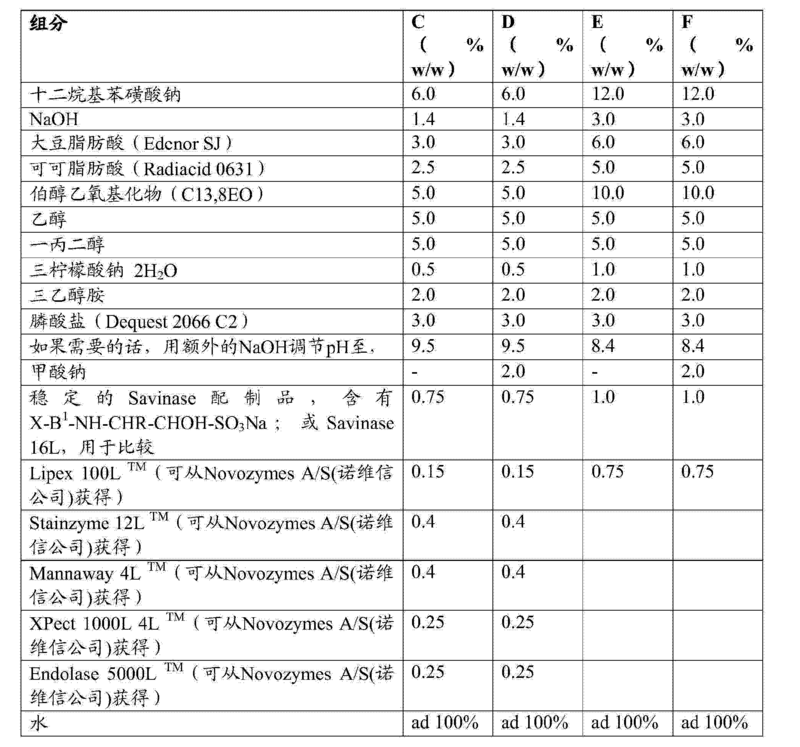 可商购的淀粉酶是 Stainzyme ；Stainzyme Plus; Duramyl™、Termamyl™、TermamylUltra ;Natalase、Fun gamy I™ 和BAN™ (Novozymes A/S (诺维信公司)、Rapidase™ 和Purastar™ (来自Genencor International Inc.(杰能科国际公司))。  Commercially available amylases are Stainzyme; Stainzyme Plus; Duramyl ™, Termamyl ™, TermamylUltra; Natalase, Fun gamy I ™ and BAN ™ (Novozymes A / S (Novozymes), Rapidase ™ and Purastar ™ ( from Genencor international Inc. (Genencor international Inc.)). 该裂解酶可以是一种果胶酸裂解酶，衍生自芽胞杆菌属，尤其是地衣芽孢杆菌或黏琼脂芽胞杆菌，或一种衍生自这些来源中任一种的变异体，例如，正如在US6，124，127、W01999/027083、W01999/027084、W02002/006442、W02002/09274U W02003/095638 中所述的，一种可商购的果胶酸裂解酶是XPect ；Pectawash和Pectaway (Novozymes A/S (诺维信公司))。  The cleavage enzyme may be a pectate lyase derived from Bacillus, especially Bacillus licheniformis or Bacillus agar stick, or one derived from any of these sources variant, e.g., As US6,124,127, W01999 / 027083, W01999 / 027084, W02002 / 006442, described in W02002 / 09274U W02003 / 095638, a commercially available pectate lyase is XPect; Pectawash and Pectaway (Novozymes A / S (Novozymes)). 甘露聚糖酶可以是一种家族5或26的碱性甘露聚糖酶。  mannanase may be an alkaline mannanase family of 5 or 26. 它可以是一种来自芽胞杆菌属或腐质霉属的野生型，特别是黏琼脂芽胞杆菌、地衣芽孢杆菌、耐盐嗜碱芽孢杆菌(B.halodurans)、克劳氏芽孢杆菌(B.clausii)、或特异腐质霉。 It may be one derived from Bacillus genus or Humicola wild type, especially sticky agar Bacillus, Bacillus licheniformis, Bacillus halodurans salt (B. halodurans), Bacillus clausii (B.clausii ), or Humicola insolens. 合适的甘露聚糖酶在W01999/064619进行了描述。 Suitable mannanases are described in W01999 / 064619. 一种可商购的甘露聚糖酶是Mannaway (Novozymes A/S (诺维信公司))。 A commercially available mannanases is Mannaway (Novozymes A / S (Novozymes)). 纤维素酶 合适的纤维素酶可以是细菌或真菌起源的。  Cellulase  Suitable cellulases may be of bacterial or fungal origin. 包括化学或遗传修饰的突变体。 Chemically or genetically modified mutants. 它可以是一种真菌纤维素酶，来自特异腐质霉(US4，435，307)或来自木霉属，例如里氏木霉或绿色木霉。 It may be a fungal cellulase from Humicola insolens (US 4,435,307) or from Trichoderma, such as Trichoderma reesei or Trichoderma viride. 纤维素酶的实例在EP0495257进行了描述。 Examples of cellulases are described in EP0495257. 可商购的纤维素酶包括Carezyme™、Celluzyme™、Celluclean™、Celluclast™ 和Endolase™ ；Renozyme ；Whitezyme (NovozymesA/S (诺维信公司))Puradax、Puradax HA 和Puradax EG (可从Genencor (杰能科公司)获得)。 Commercially available cellulases include Carezyme ™, Celluzyme ™, Celluclean ™, Celluclast ™ and Endolase ™; Renozyme; Whitezyme (NovozymesA / S (Novozymes)) Puradax, Puradax HA, and Puradax EG (available from Genencor (Jay Branch company can) get). 该肽醛可以具有式X-B1-Btl-H,其中这些基团如以上所定义，其中B°是一个单个氨基酸残基，该氨基酸残基具有式NH-CHR-CO的L-或D-构型。  The peptide can have an aldehyde of formula X-B1-Btl-H, wherein these groups are as defined above, wherein B ° is a single amino acid residue, amino acid residue having the formula L- is NH-CHR-CO or the D- configuration. d)X由一个或多个氨基酸残基构成(优选一个或两个)，任选地包括一种N-端保护基团。  d) X by one or more amino acid residues (preferably one or two), optionally including one N- terminal protection group. NH-CHR-CO(Bq)是一种L-或D-氨基酸残基，其中R可以是一种脂肪族或芳香族侧链，例如芳烷基，如苄基，其中R可以是任选取代的。  NH-CHR-CO (Bq) is an L- or D- amino acid residues, where R may be an aliphatic or aromatic side chains, for example, aralkyl groups such as benzyl, wherein R can be optionally substituted. 更特别地，B°残基可能是庞大的、中性的、极性、疏水性和/或芳香性的。 More particularly, B ° residues may be bulky, neutral, polar, hydrophobic and / or aromatic. 实例是D-或L-型的Tyr (p-酪氨酸)、m_酪氨酸、3，4-二羟基苯丙氨酸、Phe、Val、Met、正缬氨酸(Nva)、Leu、Ile或正亮氨酸(Nle)。 Examples of D- or L- form, Tyr (p- tyrosine), m_Low tyrosine, 3,4-dihydroxyphenylalanine, Phe, Val, Met, norvaline (Nva), Leu , Ile, or norleucine (Nle). 在上式X-B1-Bc1-H中，B1残基可以是特别小、脂肪性的、疏水性的和/或中性的。  In the above formulas X-B1-Bc1-H in, B1 residues can be particularly small, of fatty, hydrophobic and / or neutral. 实例是丙氨酸(Ala)、半胱氨酸(Cys)、甘氨酸(Gly)、脯氨酸(Pro)、丝氨酸(Ser)、苏氨酸(Thr)、缬氨酸(Val)、正缬氨酸(Nva)和正亮氨酸(Nle)，特别是丙氨酸、甘氨酸或缬氨酸。 Examples are alanine (Ala), cysteine ​​(Cys), glycine (Gly), proline (Pro), serine (Ser), threonine (Thr), valine (Val), n-valeric acid (Nva) and norleucine (NIe), particularly alanine, glycine or valine. 特别地，X可以是一种或两种氨基酸残基，带有一种任选的N-端保护基团(即该化合物是一种三-或四肽醛，具有或没有保护基团)。  In particular, X may be one or two amino acid residues, with an optional N- terminal protecting group (i.e., the compound is a tri - or tetra-peptide aldehyde, with or without a protecting group ). 因此，X可以是B2、B3-B2、z-B2或Z-B3-B2,其中B3和B2各自代表一个氨基酸残基，并且Z是一种N-端保护基团。 Thus, X may be B2, B3-B2, z-B2, or Z-B3-B2, wherein B2 and B3 each represent an amino acid residue, and Z is a N- terminal protection group. B2残基可以是特别小、脂肪酸和/或中性，例如Ala、Gly、Thr、Arg、Leu、Phe或Val。 B2 residues can be particularly small, fatty acids and / or neutral, e.g. Ala, Gly, Thr, Arg, Leu, Phe or Val. 特别地,B3残基可以是庞大的、疏水性的、中性和/或芳香性的，例如Phe、Tyr、Trp、苯基甘氨酸、Leu、Val、Nva、Nle或lie。 In particular, B3 residues may be bulky, hydrophobic, neutral, and / or aromatic, e.g. Phe, Tyr, Trp, phenylglycine, Leu, Val, Nva, Nle, or lie. N-端的保护基团Z (如果存在的话)可以选自甲酰基、乙酰基、苯甲酰基、三氟乙酰基、氟甲氧基羰基、甲氧基琥珀酰基、芳香族的和脂肪族的尿烷保护基团、苄氧基羰基(Cbz )、叔丁氧擬基、金刚烷基氧基擬基、对甲氧苄基擬基(M0Z)、苄基(Bn)、对甲氧苄基(PMB)或对甲氧苯基(PMP)、甲氧羰基(Moc);甲氧基乙酰基(Mac);氨基甲酸甲酯或一个甲基氨基羰基/甲基尿素甲基。  N- terminal protecting group Z (if present) may be selected from formyl, acetyl, benzoyl, trifluoroacetyl, fluoromethoxy carbonyl, methoxy succinyl, aromatic and aliphatic aromatic urethane protecting groups, benzyloxycarbonyl (Cbz), tert proposed, adamantyl group intends group, p-methoxybenzyl quasi-yl (M0z), benzyl (Bn), p-methoxybenzyl benzyl (PMB) or p-methoxyphenyl (PMP), methoxycarbonyl group (Moc); methoxyacetyl (the Mac); carbamate or a methylaminocarbonyl / methyl urea group. 在具有一种保护基团的三肽醛(即X=Z-B2)的情况下，Z优选是一种小的脂肪族基团，例如甲酰基、乙酰基、氟甲氧基羰基、叔丁氧羰基、甲氧羰基(Moc);甲氧基乙酰基(Mac);氨基甲酸甲酯或甲基氨基羰基/甲基尿素基。 In the case of a tripeptide aldehyde having a protecting group (i.e., X = Z-B2), Z is preferably a small aliphatic groups, such as formyl, acetyl, methoxycarbonyl fluorine, tert-butyl oxycarbonyl group, methoxycarbonyl group (Moc); methoxyacetyl (the Mac); carbamate aminocarbonyl or methyl / methyl urea group. 在具有一种保护基团的三肽醛(即X=Z-B3-B2)的情况下，Z优选是一种庞大的芳香基团，例如苯甲酰基、苄氧基羰基、对甲氧苄基(M0Z)、苄基(Bn)、对甲氧苄基(PMB)或对甲氧苯基(PMP)。 In the case of a tripeptide aldehyde having a protecting group (i.e., X = Z-B3-B2), Z is preferably a bulky aromatic group such as benzoyl, benzyloxycarbonyl, p-methoxybenzyl yl (M0Z), benzyl (Bn), p-methoxybenzyl (PMB) or p-methoxyphenyl (PMP). 其中P是氢或任意C-端保护基团。  wherein P is hydrogen or C- terminus of any protecting groups. 此类肽醛的实例包括a -MAP1、^ -MAP1、F-尿素-RVY-H、F-尿素_GGY_H、F-尿素-GAF-H、F-尿素-GAY-H、F-尿素-GAL-H、F-尿素-GA-Nva-H、F-尿素-GA-Nle-H、Y-尿素-RVY-H、Y-尿素-GAY-H、F-CS-RVF-H、F-CS-RVY-H、F-CS-GAY-H、抗痛素、GE20372A、GE20372B、抑糜蛋白酶素A、抑糜蛋白酶素B、以及抑糜蛋白酶素C。 Examples  Such peptide aldehyde comprising a -MAP1, ^ -MAP1, F- urea -RVY-H, F- urea _GGY_H, F- urea -GAF-H, F- urea -GAY-H, F- urea -GAL-H, F- urea -GA-Nva-H, F- urea -GA-Nle-H, Y- urea -RVY-H, Y- urea -GAY-H, F-CS-RVF-H, F-CS-RVY-H, F-CS-GAY-H, antipain, GE20372A, GE20372B, chymostatin A, chymostatin B, and chymostatin C. 肽醛的进一步实例在W02010/055052 和W02009/118375、W094/0465U W098/13459、W098/1346U W098/13462、W02007/145963中披露，将其(P&G)通过引用结合在此。 Further examples of peptide aldehydes in W02010 / 055052 and W02009 / 118375, W094 / 0465U W098 / 13459, W098 / 1346U W098 / 13462, W02007 / 145963 is disclosed, which (P & G) incorporated by reference herein. 对于肽醒，可替代地是，该蛋白酶抑制剂可以是一种具有式X-B1-Nh-CHR-CHOH-SO3M的亚硫酸氢盐加合物，其中X、B1和R如以上定义，并且M是H或一种碱性金属，优选Na或K。  For peptides to wake up, alternatively, this may be a protease inhibitor having a bisulfite adduct of formula X-B1-Nh-CHR-CHOH-SO3M, wherein X, B1 and R are as above defined, and M is H or an alkaline metal, preferably Na or K.
 该肽醛可以通过与亚硫酸氢钠的反应被转化成一种水溶性亚硫酸氢盐加合物，如在教科书，例如March, J.(马奇，J. )Advanced Organic Chemistry《高等有机化学》,第四版，Wiley-1nterscience (威利国际科学出版社)，美国1992，第895页中所描述。  The peptide aldehyde may be converted by reaction with sodium bisulfite into a water-soluble bisulfite adduct, such as in textbooks, such as March, J. (March, J.) Advanced Organic Chemistry "Higher Organic Chemistry ", Fourth Edition, Wiley-1nterscience (Wiley international Science Press), United States 1992, as described on page 895. 在该液体洗涤剂中所使用的盐是一种一价阳离子与含有I至6个碳的一价有机阴离子的盐。  In the liquid detergent used is a salt of a monovalent cation salt containing I to 6 carbon monovalent organic anions. 优选地，该一价有机阴离子是一种含有I至6个碳的一元小羧酸。 Preferably, the anion is a monovalent organic containing I to 6 carbons small monocarboxylic acids. 该一价有机阴离子优选地选自甲酸盐、乙酸盐、丙酸盐和乳酸盐。 The monovalent organic anion is preferably selected from formate, acetate, propionate and lactate. 该阳离子可以是Na+、K+或NH4+,并且该盐可以特别是甲酸钠。 The cation may be Na +, K + or NH4 +, and in particular the salt may be sodium formate. 0.01%至2%的范围内。 0.01 to 2% of the range. 1.2%或至少1.5%。 At least 1.2% or 1.5%. 该盐的量值典型地低于5%w/w，低于4%或低于3%。 The magnitude of the salt is typically below 5% w / w, less than 4%, or less than 3%. 该液体洗涤剂具有一种物理形式，它不是固体(或气体)。  The liquid detergent having one physical form, it is not solid (or gas). 它可以是一种可倾流的液体，一种可倾流的凝胶或一种不可倾流的凝胶。 It may be an pourable liquid, gel A pourable gel or a non-pourable. 它可以是各向同性的或结构性的，优选各向同性的。 It may be isotropic or structured, preferably isotropic. 它可以是一种配制品，用于在自动洗衣机中洗涤或用于手洗。 It may be a formulation, for washing or for hand washing in an automatic washing machine. 洗涤剂成分可以通过水可溶性小袋中的区室彼此物理性地分开。  The detergent components can be separated physically by the water-soluble pouch compartments each other. 因此，可以避免组分间的不良的存储相互作用。 Thus, to avoid adverse interactions between components stored. 这些区室各自不同的溶解特性曲线还可以在该洗涤溶液中造成所选组分溶解的延迟。 These compartments respectively different dissolution profiles can also cause delay of the selected components are dissolved in the wash solution. 该洗涤剂组分可以采用一种单位剂量产物的形式。  The detergent component may be a unit dosage form of the product used. 一个单位剂量的产品是在一个不可重复利用的容器中的单一剂量的包装。 A unit dose of a product is not reusable container single dose packaging. 它被越来越多的应用在针对衣服洗涤和餐具洗涤的洗涤剂中。 It is increasingly used in detergents for dishwashing and clothes washing in. 一个洗涤剂单位剂量产物是在单次洗涤中所用的洗涤剂量值的包装(例如，在由一种水溶性薄膜制得的一个小袋中)。 A unit dose detergent product is used in a single wash detergent packaging magnitude (e.g., resulting in a pouch made from a water soluble film). 小袋可以是适于保存该组合物的任意形式、任何形状、和任何材料，例如不允许该组合物在与水接触之前从该小袋中释放出。  The pouch may be stored in any form suitable for the composition, any shape and any material, for example, does not allow the release of the composition from the pouch prior to contact with the water. 该小袋由水溶性薄膜制成，它包含了一个内部体积。 The pouch is made of a water-soluble film which contains an internal volume. 所述的内部体积可以被分成小袋的区室。 The interior volume may be divided into compartments of the pouch. 优选的薄膜是高分子材料，优选被制成薄膜或薄片的形式的聚合物。 Preferred films are polymeric materials, preferably made in the form of a polymer film or sheet. 优选的聚合物、共聚物或其衍生物选自聚丙烯酸酯、以及水溶性丙烯酸酯共聚物、甲基纤维素、羧甲基纤维素、糊精钠、乙基纤维素、羟乙基纤维素、羟丙基甲基纤维素、麦芽糊精、聚丙烯酸甲酯，最优选聚乙烯醇共聚物以及羟丙基甲基纤维素(HPMC)。 Preferred polymers, copolymers or derivatives thereof are selected from polyacrylates and water-soluble acrylate copolymers, methylcellulose, carboxymethylcellulose sodium, dextrin, ethyl cellulose, hydroxyethyl cellulose , hydroxypropyl methyl cellulose, maltodextrin, polymethyl acrylate, most preferably polyvinyl alcohol copolymers and hydroxypropyl methyl cellulose (HPMC). 优选地，薄膜中聚合物例如PVA的水平是至少约60%。 Preferably, the level of polymer such as PVA film is at least about 60%. 优选的平均分子量将典型地是约20，000至约150，000。 Preferred average molecular weight will typically be from about 20,000 to about 150,000. 薄膜还可以是一种混合组合物，包括可通过水解可降解的以及水溶性的聚合物混合物，例如聚乳酸和聚乙烯醇(已知在贸易参考(Trade reference)M8630 下，由Chris Craft In.Prod.0f Gary, Ind.，US 销售)，以及增塑剂,像甘油、乙二醇、丙二醇、山梨糖醇及其混合物。 Film may also be a mixed composition comprising degradable by hydrolysis and water-soluble polymer mixture, such as polylactic acid and polyvinyl alcohol (known under the trade reference (Trade reference) M8630, a Chris Craft In. Prod.0f Gary, Ind., US sales), and a plasticizer, such as glycerol, propylene glycol, sorbitol and mixtures thereof. 这些小袋可以包含由该水溶性薄膜分隔的一种固体洗衣清洁组合物或部分组分和/或一种液体清洁组合物或部分组分。 These pouches may contain water-soluble film separated by a solid laundry cleaning composition or part of the components and / or a liquid cleaning composition or a component part. 组合物中，液体组分的区室可以与含有固体的区室不同(见例如US2009/0011970)。 Composition, the liquid component compartment may be different solid containing compartment (see e.g. US2009 / 0011970). 洗涤剂组分的选择可以包括，用于织物保养，考虑有待清洁的织物的类型，污染物的种类和/或程度，清洁时的温度，以及该洗涤剂产物的配制。  The choice of detergent components may include, for fabric care, consider the type of fabric to be cleaned, type of pollutant and / or extent of cleaning temperature, and formulated detergent product. 虽然以下提及的组分根据特定功能通过通用标题(general header)进行分类,但不能理解为是一种限制，因为正如本领域的普通技术人员所理解的，一种组分可以包含额外的功能。 Although the components mentioned below are classified by the common title (general header) according to a particular function, but can not be construed as a limitation, since, as those of ordinary skill in the art will appreciate, one component may comprise additional features . 在该说明书中，阴离子表面活性剂可以分为一个第一组，该组对酶的稳定性存在有害作用(枯草杆菌蛋白酶以及任选的第二酶)，以及一个第二组，该组对这些酶的稳定性的有害作用较低。  In this specification, the anionic surfactant may be divided into a first group, the deleterious effects of the presence of the group (subtilisin and optionally a second enzyme) stability of the enzyme, and a second group, the group less deleterious effects on the stability of these enzymes. 在第一(有害)组中，该液体洗涤剂中表面活性剂的总含量大于第二(有害性较低)组中的总含量。 In the first (hazardous) group, the total content of the surfactant in the liquid detergent is greater than the second (less hazardous) the total content of the group. 因此，本发明涉及改进液体洗涤剂中酶的稳定性，否则该表面活性剂配制品的酶稳定性会相当差。 Accordingly, the present invention relates to improved stability of enzymes in liquid detergents, the enzyme or surfactant stability of the formulation will be very poor. 该第一组含有直链和支链烷基苯磺酸盐(LAS和BASS)以及烷基硫酸盐(AS)。  The first group comprises linear and branched alkylbenzene sulfonates (LAS and BASS) and alkyl sulfates (AS). 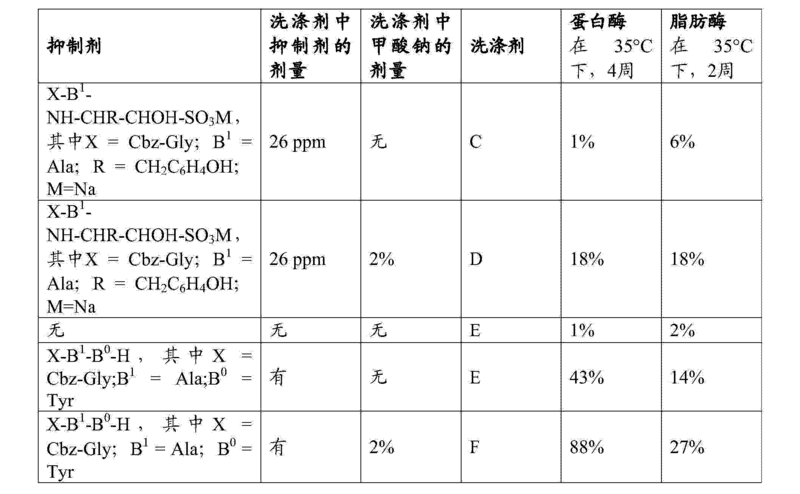 该第二组包括烷基乙氧基醚硫酸盐(AES)和甲酯磺酸盐(MES)。 The second group includes alkyl ethoxy ether sulfates (AES) and methyl ester sulphonates (MES). 该第一组还包括LAS和支链烷基苯磺酸盐(BABS)和苯基烷基磺酸盐的异构体。  The first group further comprises isomer LAS and branched alkylbenzene sulfonates (BABS) alkyl and phenyl sulfonate. 烷基硫酸盐(AS )可以包括十二烷基硫酸钠(SDS )或脂肪醇硫酸盐(FAS )，伯醇硫酸盐(PAS )。 Alkyl sulfates (AS) may include sodium dodecyl sulfate (SDS) or fatty alcohol sulfates (FAS), primary alcohol sulphate (PAS). `` 在该第二组中，醇醚硫酸盐(AES)也被称为乙氧基硫酸醇(AEOS)或脂肪醇硫酸盐(FES)，包括月桂基乙醚硫酸钠(SLES)。 ``  In the second set, alcohol ether sulfates (AES), also known as alcohol ethoxysulfate (AEOS) or fatty alcohol sulfates (the FES), comprising sodium lauryl ether sulfate (SLES). a-磺酸基甲基脂肪酸酯(MEA，a-SFMe*SES)。 fatty acid methyl ester a- group (MEA, a-SFMe * SES). 该液体洗涤剂含有LAS，例如含量为按照重量计1%_30%，例如从约1%_15% ;并且它可以含有第一组的表面活性剂，量值为按重量级1%_50%，例如2%-30%，并且它可以含有第二组的表面活性剂，其量值低于第一组的量，例如按重量计1%_25%。  The liquid detergent contains LAS, for example, according to an amount of 1% _30% by weight, for example from about 1% _15%; and it may contain a surfactant of the first group, in amounts of 1% by heavyweight _50 %, e.g. 2% to 30%, and it may contain a surfactant of the second group, in an amount lower than the amount of the first group, for example, 1% by weight _25%. 该液体洗涤剂可以进一步含有其他阴离子表面活性剂，例如肥皂和或脂肪酸、a-烯烃磺酸酯(A0S)、十二碳烯基/十四碳烯基琥珀酸(DTSA)、氨基酸的脂肪酸衍生物、磺酸基琥珀酸或肥皂的二酯以及单酯，及其组合。  The liquid detergent may further contain other anionic surfactants, such as soaps or fatty acids and, A- olefin sulfonates (A0S), dodecenyl / tetradecenyl succinic acid (the DTSA), amino acids fatty acid derivatives, sulfonic acid or soap monoesters and diesters, and combinations thereof. 当包含在其中时，该洗涤剂通常将含有按重量计从约0.1%至约70%的一种非离子性表面活性剂，例如从约0.5%至约30%，尤其是从约1%至约20%，从约2%至约15% ;或从30% 至60%。  When included therein, the detergent will usually contain by weight from about 0.1% to about 70% of a nonionic surfactant, e.g., from about 0.5% to about 30%, in particular from about 1% to about 20%, from about 2% to about 15%; or from 30% to 60%. 可任选地，该液体洗涤剂可以含有一种额外的酶稳定剂，例如一种多元醇，例如丙二醇(MPG)、山梨醇或甘油，例如，量值为0.5-10%w/w。  Optionally, the liquid detergent may contain one additional enzyme stabilizers, for example a polyol such as propylene glycol (MPG), sorbitol or glycerol, e.g., in amounts of 0.5-10% w / w.
 任选地，该洗涤剂可以还有0-10%的乙醇；或例如在任选地存在着其他任何多元醇的情况下0-5%的乙醇。  Optionally, the detergent may also 0-10% of ethanol; e.g. 0-5% ethanol or in a case where there is any optionally other polyols. 该水性液体洗涤剂可以还有从0-30%的有机溶剂，包括EtOH和多元醇。 The aqueous liquid detergent may be from 0-30%, as well as organic solvents, including EtOH, and polyhydric alcohols. 该液体洗漆剂可以包括一种助洗剂,例如柠檬酸钠或柠檬酸,例如量值为0_5%w/w，例如约0.1%-2%。  The liquid removers may comprise a builder, such as sodium citrate or citric acid, for example, in amounts of 0_5% w / w, for example about 0.1% to 2%. 其他缓冲系统可以包括醇胺，例如单、二或三乙醇胺(MEA、DEA或TEA)，水平是0.1%-5%。 Other buffer systems may include alcohol amines, such as mono-, di- or triethanolamine (MEA, DEA or TEA), 0.1% to 5% level. 该液体洗涤剂的pH可以在6.0-10的范围内；尤其在6.5-9.5之间；或在7_9之间。  pH of the liquid detergent may be in the range of 6.0-10; or between 7_9; in particular between 6.5-9.5. PH可以在该洗涤剂中或在水中的5%溶液中直接测量。 PH can be measured directly or in a 5% solution in water in the detergent. 该液体洗涤剂还可以包含微量物质(minor)，例如聚合物、黏性控制剂(例如，NaCl或聚合物)；防腐剂、染料转移抑制剂、香料；遮光剂；织物色调剂(fabric huing agent);以及消泡剂。  The liquid detergent may also contain minor amounts of substance (Minor), such as polymers, viscosity control agents (e.g., NaCl, or polymers); preservatives, dye transfer inhibitors, perfumes; opacifiers; fabric toner ( fabric huing agent); and an antifoaming agent. 该液体洗涤剂基本上不含硼化合物，并且具有低水平的钙。  The liquid detergent is substantially free of boron compounds and a low level of calcium. 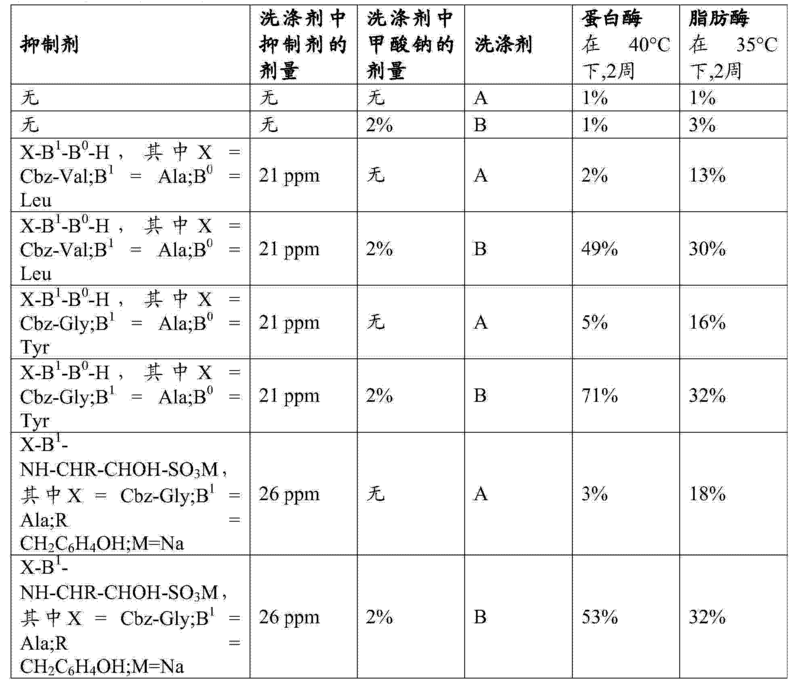 因此，硼含量低于500ppm B (按重量计)，并且钙含量可以低于500ppm (Ca)。 Accordingly, the boron content is less than 500ppm B (by weight), and the calcium content may be below 500ppm (Ca). 该液体洗涤剂是水性的，含有按重量计至少10%并且高达95%的水，例如20%_90%的水、40%-80%的水；或者至少(超过)50%的水。  The liquid detergent is aqueous, comprising at least 10% by weight and up to 95% water, for example 20% _90% water, 40% -80% water; or at least (more than) 50% water . 它的直链烷基苯磺酸盐以及支链烷基苯磺酸盐(LAS和BASS)和烷基硫酸盐(AS)的总含量大于烷基乙氧基醚硫酸盐(AES)和甲酯磺酸盐(MES)的总含量。  It linear alkylbenzenesulfonates and branched alkylbenzenesulfonates (LAS and BASS) and alkyl sulfates (AS) is greater than the total amount of alkyl ethoxy ether sulfate (AES) and the total content of methyl ester sulfonates (MES) of. 优选地,B0 是Tyr、m_ 酪氨酸、3，4_ 二轻苯丙氨酸、Phe、Val、Met、Nva、Leu、Ile 或Nle的一种L-或D-氨基酸残基。  Preferably, B0 is Tyr, m_ tyrosine, phenylalanine two light 3,4_, Phe, Val, Met, Nva, Leu, Ile or Nle an L- or D- amino acid residues. 优选地，B1是一种带有小的可任选取代的脂肪族侧链的残基，优选Ala、Cys、Gly、Pro、Ser> Thr> Val、Nva 或Nle。  Preferably, B1 is an optionally substituted with a small aliphatic side chain residue, preferably Ala, Cys, Gly, Pro, Ser> Thr> Val, Nva or Nle. 优选地，X是B2、B3-B2、Z-B2、Z-B3-B2,其中B2和B3各自代表一个氨基酸残基，并且Z是一种N-端保护基团。  Preferably, X is B2, B3-B2, Z-B2, Z-B3-B2, wherein B2 and B3 each represent an amino acid residue, and Z is a N- terminal protection group. 优选地，B2 是Val、Gly、Ala、Arg、Leu、Phe 或Thr 的一种单一残基。  Preferably, B2 is Val, Gly, Ala, Arg, Leu, Phe or Thr one single residue. 优选地，B3 是Phe、Tyr、Trp、苯基甘氨酸、Leu、Val、Nva、Nle 或lie。  Preferably, B3 is Phe, Tyr, Trp, phenylglycine, Leu, Val, Nva, Nle, or lie. 在一个实施例中，该一价有机阴离子是甲酸盐、乙酸盐、丙酸盐或乳酸盐；优选甲酸盐。  In one embodiment, the monovalent organic anion is formate, acetate, propionate or lactate; preferably formates. 在一个实施例中，该一价阳离子是Na、K或NH4。 In one embodiment, the monovalent cation is Na, K or NH4. 在一个优选的实施例中，该盐是甲酸钠。 In a preferred embodiment, the salt is sodium formate. 更优选地，该盐是按总组合物的重量计至少0.1%的量值存在的。 More preferably, the salt is by weight of the total composition, of at least 0.1% of the present value. 在一个实施例中，该液体洗涤剂组合物进一步包括一种第二酶，特别是果胶酸裂解酶、甘露聚糖酶、淀粉酶或脂肪酶。  In one embodiment, the liquid detergent composition further comprises one second enzymes, especially pectate lyase, mannanase, an amylase or a lipase. 在一个实施例中，该液体洗涤剂组合物进一步包括一种多元醇。  In one embodiment, the liquid detergent composition further comprises a polyol. 在一个实施例中，该液体洗涤剂组合物包括按重量计至少50%的水。  In one embodiment, the liquid detergent composition comprises at least 50% by weight of water. 通用实验细节:将洗涤剂，含有Savinase 16L以及X-B1-Bc1-H或X-B1-NH-CHR-CHOH-SO3Na ;或Savinase 16L ;放置在-18°C 的密闭的玻璃容器中；35°C 和40°C。  General Experimental Details: The detergents containing Savinase 16L and X-B1-Bc1-H or X-B1-NH-CHR-CHOH-SO3Na; or Savinase 16L; -18 ° C is placed in a sealed glass vessel in; 35 ° C and 40 ° C. 在不同时间后，使用标准的分析方法，测量蛋白酶和脂肪酶的残余活性(蛋白酶在40°C、pH8.3下通过N，N- 二甲基酪蛋白的水解，并且脂肪酶通过在40°C、pH7.7下通过正戊酸对硝基苯酹酯(pNp-valerate)的水解)。 After different times, using standard analytical methods, measuring the residual protease and lipase activity (protease at 40 ° C, pH8.3 by N, N- dimethyl hydrolysis of casein and fat by enzyme at 40 ° C, pH7.7 by hydrolysis of p-nitrophenyl n-valeric acid ester sprinkle (pNp-valerate) a). 该抑制剂和蛋白酶还可以各个地加入到该洗漆剂中。 The protease and inhibitor may also be added to the respective paint washing agent. 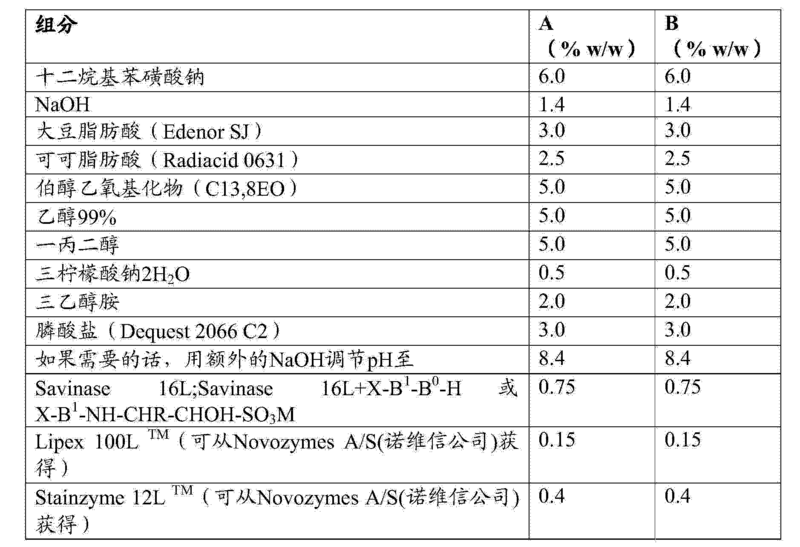 向一种可商购的 Savinasel6L™(Novozymes A/S(诺维信公司)，Bagsvaerd,丹麦)中加入0.TS0ZoX-B1-B0-H或0.Q0ZoX-B1-NH-CHR-CHOH-SO3Na„加入呈固体或液体溶液的该抑制剂。优选的实例包括X=Cbz-Gly- J1=Ala ；B0=Tyr ;R=CH2 (C6H4) OH。  Savinasel6L ™ to a commercially available (Novozymes A / S (Novozymes), Bagsvaerd, Denmark) was added 0.TS0ZoX-B1-B0-H or 0.Q0ZoX-B1-NH-CHR- . CHOH-SO3Na "was added as a solid or a liquid solution of the inhibitor preferred examples include X = Cbz-Gly- J1 = Ala; B0 = Tyr; R = CH2 (C6H4) OH. 作为具有一种稳定的枯草杆菌蛋白酶配制品的液体洗涤剂的实例，制造了在表1中描述的这些组合物。  As examples of a liquid detergent having a stabilized subtilisin formulation, manufacture of these compositions described in Table 1. 将这些洗涤剂存储在35°C和40°C下，并且在两周后检测残余的蛋白酶和脂肪酶活性(表示为原始活性的％)，如表2中所示。  These detergents stored at 35 ° C and 40 ° C, and tested for residual protease and lipase activity after two weeks (expressed as% of the original activity), as shown in Table 2. 前四行的比对显示，残余的蛋白酶/脂肪酶活性是1%/1%，没有任何稳定剂。  than the first four lines of the display, the residual protease / lipase activity was 1% / 1%, without any added stabilizer. 只加入甲酸钠将其改进至1%/3%，且只加入该肽醛将其改进至2%/13%，但是甲酸钠和肽醛的组合将残余活性增加至49%/30%，这明显证明了协同的酶稳定性作用。 Addition of only sodium formate to improve it to 1% / 3%, and only added to the peptide aldehyde will improve it to 2% / 13%, but the combination of sodium formate and peptide aldehydes will increase the residual activity to 49% / 30%, demonstrating clearly that stability of the synergistic action of the enzyme. 对于另一个肽醛和对于一种亚硫酸氢盐加合物，上表中证明了一种类似的协同作用。 For another, and for one peptide aldehyde bisulfite adduct of sulfuric acid, the above table demonstrate a similar synergism. 一种洗涤剂的制备，该洗涤剂包括一种稳定的枯草杆菌蛋白酶配制品和表面活性剂系统。  A process for preparing a detergent, the detergent comprising a stabilized subtilisin formulation and a surfactant system. 作为具有一种稳定的枯草杆菌蛋白酶配制品的洗涤剂的另一个实例，制造了在表3中描述的这些组合物。  As another example of a detergent having a stabilized subtilisin formulation, manufacture of these compositions are described in Table 3. 将这些洗涤剂存储在35°C下，并且在两周和四周后检测残余的蛋白酶和脂肪酶活性(表示为原始活性的％)，如表4所示。  These detergents stored at 35 ° C, and tested for residual protease and lipase activity after two weeks and four weeks (expressed as% of the original activity), as shown in Table 4. 这些数据清楚地证明，甲酸钠(一价有机阴离子和一价阳离子的盐)与一种肽醛(或亚硫酸氢盐加合物)蛋白酶抑制剂组合显著地增加了酶稳定作用。  These data clearly demonstrate that a combination of protease inhibitors (organic salt of a monovalent anion and a monovalent cation) a peptide aldehyde with sodium formate (or bisulfite adducts) significantly increased the enzyme stabilizing effect. 1.一种无硼的液体洗涤剂组合物，包括a) 一种直链烷基苯磺酸盐(LAS)， b) 一种枯草杆菌蛋白酶， c) 一种枯草杆菌蛋白酶抑制剂，它是一种肽醛或其亚硫酸氢盐加合物， d) 一种一价阳离子与具有I至6个碳的一价有机阴离子的盐，以及e)至少10%的水； 该组合物的直链烷基苯磺酸盐以及支链烷基苯磺酸盐(LAS和BASS)和烷基硫酸盐(AS)的总含量大于烷基乙氧基醚硫酸盐(AES)和甲酯磺酸盐(MES)的总含量。 CLAIMS 1. A boron-free liquid detergent composition comprising a) a linear alkyl benzene sulphonate (LAS), b) one kind of subtilisin, c) one subtilisin inhibitor, it is a peptide aldehyde or a bisulfite adduct, d) one of a monovalent cation having I to 6 carbon monovalent organic anion salt thereof, and e) at least 10% of water; the composition linear alkylbenzenesulfonates and branched alkylbenzenesulfonates (LAS and BASS) and alkyl sulfates (AS) is greater than the total amount of alkyl ethoxy ether sulfates (AES) and methyl ester sulfonates (MES) of the total content. 2.如前项权利要求所述的液体洗涤剂组合物，其中该抑制剂是一种具有式X-B1-Btl-H的肽醛或其一种亚硫酸氢盐加合物，其中: a) H是氢； b) B0是一种单个D-或L-氨基酸残基； ^B1是一种单个氨基酸残基；并且d) X由一个或多个氨基酸残基构成(优选一个或两个)，任选地包括一种N-端保护基团。 2. The liquid detergent composition according to the preceding claim, wherein the inhibitor is a peptide aldehyde or one having a bisulfite adduct of formula X-B1-Btl-H, wherein: a ) H is hydrogen; b) B0 is a single amino acid residues in D- or L-; ^ B1 is a single amino acid residue; and d) X by one or more amino acid residues (preferably one or two ), optionally including one N- terminal protection group. 3.如权利要求2所述的液体洗涤剂组合物，其中B°是Tyr、m-酪氨酸、3，4- 二羟苯丙氨酸、卩1^、¥&1、]^七、化&、1^11、Ile或Nle的一种L-或D-氨基酸残基。 The liquid detergent composition according to claim 2, wherein B ° is Tyr, m- tyrosine, 3,4-dihydroxyphenylalanine, Jie 1 ^, ¥ & 1,] ^ VII of &, ^ 1 11 a L- or D- amino acid residue of Ile or Nle. 4.如权利要求2-3中任一项所述的液体洗涤剂组合物，其中B1是一种带有小的可任选取代的脂肪族侧链的残基，优选Ala、Cys> Gly、Pro、Ser> Thr> Val> Nva或Nle。 2-3 4. A liquid detergent composition according to any one of claims, wherein the residues of one B1 is optionally substituted with a small aliphatic side chain, preferably Ala, Cys> Gly, Pro, Ser> Thr> Val> Nva or Nle. 5.如权利要求2-4中任一项所述的液体洗涤剂组合物，其中X是B2、B3-B2, Z-B2,Z-B3-B2,其中B2和B3各自代表一个氨基酸残基，并且Z是一种N-端保护基团。 2-4 as claimed liquid detergent composition according to any of the Z-B3-B2 claim, wherein X is B2, B3-B2, Z-B2,, wherein B2 and B3 each represent an amino acid residue , and Z is a N- terminal protection group. 6.如权利要求5所述的液体洗涤剂组合物，其中B2是Val、Gly、Ala、Arg、Leu、Phe或Thr的一种单个残基。 A liquid detergent composition as claimed in claim 5, wherein B2 is Val, Gly, Ala, Arg, Leu, Phe or Thr a single residue. 7.如权利要求5-6中任一项所述的液体洗涤剂组合物，其中B3是Phe、Tyr、Trp、苯基甘氨酸、Leu> Val、Nva、Nle 或lie。 The liquid detergent composition according to any one of claims 5-6, wherein B3 is Phe, Tyr, Trp, phenylglycine, Leu> Val, Nva, Nle, or lie. 8.如前述权利要求中任一项所述的液体洗涤剂组合物，其中该抑制剂是以下肽醛或其亚硫酸氢盐加合物中的一种:Cbz-RAY-H、Ac-GAY-H, Cbz-GAY-H, Cbz-GAL-H, Cbz-VAL-H,Cbz-GAF-H, Cbz-GAV-H, Cbz-GGY-H, Cbz-GGF-H, Cbz-RVY-H, Cbz-LVY-H, Ac-LGAY-H,Ac-FGAY-H, Ac-YGAY-H, Ac-FGAL-H, Ac-FGAF-H, Ac-FGVY-H, Ac-FGAM-H, Ac-WLVY-H、Me0-C0-VAL-H、MeNC0-VAL-H、Me0-C0-FGAL-H、Me0-C0-FGAF-H、MeS02_FGAL-H、MeS02-VAL-H、PhCH2O(OH) (O)P-VAL-H、EtSO2-FGAL-H, PhCH2SO2-VAL-H, PhCH2O(OH) (O)P-LAL-H、PhCH2O(OH) (O)P-FAL-H、MeO(OH) (0)P_LGAL_H、a -MAP1、^ -MAP1、F-尿素-RVY-H、F-尿素-GGY-H、F-尿素-GAF-H、F-尿素-GAY-H、F-尿素-GAL-H、F-尿素-GA-Nva-H、F-尿素-GA-Nle-H、Y-尿素-RVY-H、Y-尿素-GAY-H、F-CS-RVF-H、F-CS-RVY-H、F-CS-GAY-H、抗疼素、6£203724、6£203728、抑糜蛋白酶素么、抑糜蛋白酶素8、或糜蛋白酶抑素(:。 Cbz-RAY-H, Ac-GAY: A liquid detergent composition according to any preceding claim 8, wherein the inhibitor is one of the following peptide aldehyde or a bisulfite adduct of sulfuric acid -H, Cbz-GAY-H, Cbz-GAL-H, Cbz-VAL-H, Cbz-GAF-H, Cbz-GAV-H, Cbz-GGY-H, Cbz-GGF-H, Cbz-RVY-H , Cbz-LVY-H, Ac-LGAY-H, Ac-FGAY-H, Ac-YGAY-H, Ac-FGAL-H, Ac-FGAF-H, Ac-FGVY-H, Ac-FGAM-H, Ac -WLVY-H, Me0-C0-VAL-H, MeNC0-VAL-H, Me0-C0-FGAL-H, Me0-C0-FGAF-H, MeS02_FGAL-H, MeS02-VAL-H, PhCH2O (OH) ( O) P-VAL-H, EtSO2-FGAL-H, PhCH2SO2-VAL-H, PhCH2O (OH) (O) P-LAL-H, PhCH2O (OH) (O) P-FAL-H, MeO (OH) (0) P_LGAL_H, a -MAP1, ^ -MAP1, F- urea -RVY-H, F- urea -GGY-H, F- urea -GAF-H, F- urea -GAY-H, F- urea -GAL -H, F- urea -GA-Nva-H, F- urea -GA-Nle-H, Y- urea -RVY-H, Y- urea -GAY-H, F-CS-RVF-H, F-CS -RVY-H, F-CS-GAY-H, anti-pain prime, 6 £ 203724,6 £ 203728, it chymostatin, 8 chymostatin, endostatin or chymotrypsin (:. 9.如前述权利要求中任一项所述的液体洗涤剂组合物，其中该阴离子是甲酸盐、乙酸盐、丙酸盐或乳酸盐，优选甲酸盐。 The liquid detergent composition according to claim 9. preceding claims, wherein the anion is formate, acetate, propionate or lactate, preferably formates. 11.如前述权利要求中任一项所述的液体洗涤剂组合物，其中该盐是甲酸钠。 11. A liquid detergent composition according to any of the preceding claims, wherein the salt is sodium formate. 12.如前述权利要求中任一项所述的液体洗涤剂组合物，其中该盐是按总组合物的重量计至少0.1%的量值存在的。 12. preceding claims one of the liquid detergent composition, wherein the salt is by weight of the total composition, of at least 0.1% of the present value. 13.如前述权利要求中任一项所述的液体洗涤剂组合物，进一步包括一种第二酶，特别是果胶酸裂解酶、甘露聚糖酶、淀粉酶或脂肪酶。 13. preceding claims one of the liquid detergent composition further comprises one second enzymes, especially pectate lyase, mannanase, an amylase or a lipase. 14.如前述权利要求中任一项所述的液体洗涤剂组合物，进一步包括一种多元醇。 14. A liquid detergent composition according to any of the preceding claims, further comprising a polyol. 15.如前述权利要求中任一项所述`的液体洗漆剂组合物,包括按重量计至少50%的水。 15. The `a liquid washing agent paint composition, comprising at least 50% by weight of water in any preceding claim. DE3684398D1 (en) 1985-08-09 1992-04-23 Gist Brocades Nv Lipolytic enzymes and their application in cleaning products. ES2058119T3 (en) 1986-08-29 1994-11-01 Novo Nordisk As Enzymatic detergent additive. DE3854249T2 (en) 1987-08-28 1996-02-29 Novo Nordisk As Recombinant Humicola lipase and process for the production of recombinant Humicola lipases. DE59101948D1 (en) 1990-04-14 1994-07-21 Kali Chemie Ag Alkaline bacillus lipases, coding therefor dna sequences and bacilli that produce these lipases. ES2121786T3 (en) 1990-09-13 1998-12-16 Novo Nordisk As Lipase variants. BE1008998A3 (en) 1994-10-14 1996-10-01 Solvay Lipase, microorganism producing the preparation process for the lipase and uses thereof. BR9712111A (en) 1996-09-24 1999-08-31 Procter & Gamble Liquid detergents containing proteolytic enzyme and protease inhibitors. EP0878535A1 (en) 1998-11-18 Light-duty liquid or gel dishwashing detergent compositions which are microemulsions and which have desirable greasy food soil removal and sudsing characteristics.